An exterior view of the store. 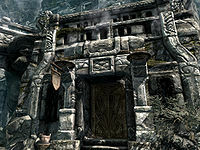 Arnleif and Sons Trading Company is a general goods store located by the market stalls next to the entrance, on the north side of Markarth. The store is managed by Lisbet, who inherited it from her husband Gunnar, son of Arnleif. The store consists of three rooms: a large main area where the store is located and two smaller rooms with two doors on the north wall. The store has fallen on hard times due to the Forsworn constantly capturing shipments of goods. The store does not display any of its merchandise. Upon entering there is a short corridor into the main room with a raised section around the walls of the room and two pillars that support the ceiling with a counter between them with wings from the pillars towards the back of the store forming a square U-shape. Lisbet will spend most of the day stood behind the counter while Imedhnain wanders the store and sweeps up. There is little to nothing of interest on the raised section even with a large number of shelving units. There is a leather strip on a shelf against the west wall and an archery target in the northwestern corner. There is a woodcutter's axe, a food barrel, an expert locked strongbox containing random items, and a business ledger on a stone ledge all between the two doors at the rear of the store, against the north wall. There are a piece of sliced goat cheese and two loaves of bread on two different shelves against the east wall. Everything else on the raised section is clutter. There are stairs down to a sunken middle of the room halfway along each of the walls. Descending to the sunken area there are even more shelves against the raised section around the room, with a rock warbler egg in a wooden bowl on a dresser to the west, a copy of the Speech skill book A Dance in Fire, v7 on a crate to the north, a dresser containing clothes to the east, and a gourd on a shelf to the south. To the west of the counter is a rack hanging from the ceiling holding a rabbit. On the west side of the counter is a bulb of garlic with a garlic braid hanging above, while on the east side of the counter is a cabbage and potato with a bunch of elves ear hanging above. Under the counter is a copy of The Code of Malacath. The bedroom to the northwest consists of two owned single beds; one to the east and one to the west both having stone ledges as part of the walls. The ledge to the east has an iron dagger and a green apple on top, while the other ledge has a loaf of bread and a goat cheese wedge. There is also a dresser against the north wall. The room to the northeast consists of a single owned bed against the east wall and a huge fireplace to the north with a cast iron pot on the floor beside it holding a portion of grilled leeks and a potato. Against the west wall is a long wooden table with a bottle of alto wine, a portion of grilled leeks, a potato, a loaf of bread and a cabbage in a cast iron pot. To the right of the table is an unlocked chest on a stone ledge with a copy of Dwarves, v3 leaning against it. The chest contains leveled items. To the left of the table is a cooking pot on a stand. There are also a few food sacks throughout the building. Once Lisbet has been befriended by completing Lisbet's Missing Shipment, the shop can be freely looted, right down to openly picking the Strongbox towards the back and taking any gold within. The store will stay open for business until you enter for the first time, after which it will keep normal hours. The key to the store is carried by both Lisbet and Imedhnain. There is a Loot shadowmark to the top left of the entrance door. If anything happens to Lisbet, her assistant, Imedhnain, will take over running the store. All containers in the area, with the exception of some barrels and sacks, are non-respawning. The front door of this store may be locked at all hours of the day. Picking the lock and entering the shop will resolve this, and the shop will lock/unlock at the normal times thereafter. This page was last modified on 17 June 2017, at 16:10.